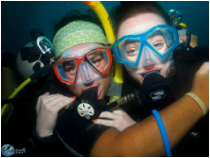 The PADI Scuba Diver Course is an entry level course, and is perfectly suited to someone who does not have the time to complete a PADI Open Water Course, or for someone who simply wants to obtain a license to dive with minimal effort. 2 days are all that are required and afterwards you get a license to dive but with a few restrictions compared to the full PADI Open Water License. Upon completion, you will be certified to dive under professional supervision to a maximum depth of 12 metres. Take the medical questionnaire to determine if you meet health requirements, and you should be comfortable in water and in good health. You must be able to float in water too deep to stand for 10 minutes. Knowledge Development (online with PADI eLearning or in a classroom) to understand the basic principles of scuba diving by watching the PADI Open Water Diver video, using the Open Water Diver manual and completing 3 knowledge review exercises and 3 short quizzes. 3 Confined Water Dives to learn and master basic scuba skills. 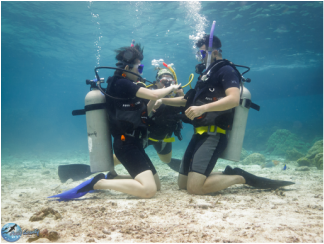 2 Open Water Dives to review your skills and explore the sea. Dedicated Instructors will help guide you along the way. With the PADI Scuba Diver qualification, you are certified to dive to a depth of 12 meters with professional supervision. You can always choose to upgrade at a later date to the PADI Open Water Diver Course when you have more time or when you feel comfortable to do so. We conduct the skills portion of the course in the sea in shallow water and will go to deeper water (maximum 12m) 2 times during your course and get to see some of the beautiful sites around Perhentian.